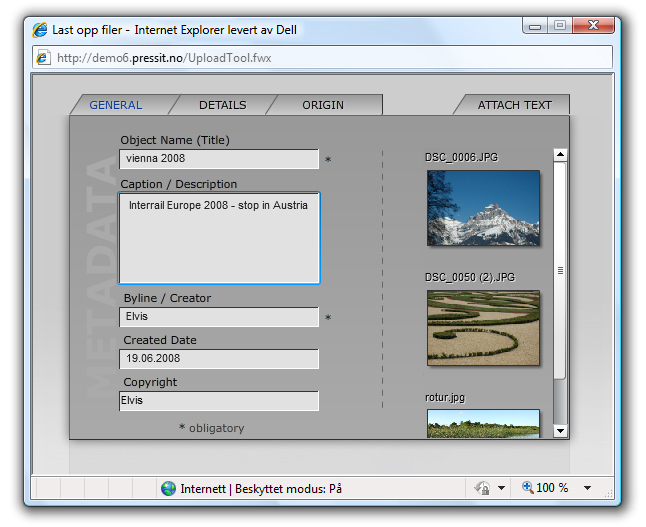 The Metadata Uploader is a module which allows for uploading of media files with customized obligatory metadata fields in image archives with browser access. On upload the user selects the files and drops them into the Metadata Uploader. Then the user inserts the required metadata and further optional fields if wanted. The files can only be uploaded when all obligatory fields have been filled. This module is especially useful in environments where the metadata fields are very specific and has crucial importance for effective searches later on (i.e. established case number systems). By making it obligatory to insert this metadata on upload, large numbers of non-indexed files or inconsistently indexed files will no longer be a problem. The module can be customized to include only a few demanded fields – or a larger number of fields with instructions for what needs to be entered. The Metadata Uploader demands no installation on the client, only on the server.